Ten Speed Press, 9781607745006, 184pp. A seasonal collection of enticing, comforting recipes for sweet and savory whole-grain breakfasts including granola, warm porridges, muffins, savory tarts and eggs—as well as seasonal toppings and accompaniments like homemade yogurt and almond milk, all from the writer of the popular blog A Sweet Spoonful. A beautiful guide to morning meals, Whole-Grain Mornings offers sixty-ﬁve sweet and savory recipes for wholesome whole-grain breakfasts. Whether you’re cooking for busy weekdays, slow Sundays, or celebratory brunches, this charming cookbook will inspire you to look beyond the average bowl of cereal toward healthy and delicious ways to incorporate whole grains like amaranth, farro, and barley into your morning meals. Seasonally organized recipes feature favorite one-bowl breakfast fare like Apricot Pistachio Granola and Triple-Coconut Quinoa Porridge alongside more unconventional options like Saucy Tomato Poached Eggs with Kale and Wheat Berries and Nutty Millet Breakfast Cookies. 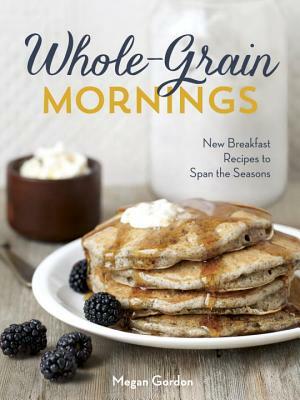 With information on timesaving alternatives as well as a guide to the most commonly used whole grains—and sprinkled with abundant food and lifestyle photography throughout—this cookbook guarantees the most important meal of the day will also become your favorite. MEGAN GORDON is a writer, recipe developer, and culinary educator living in Seattle. She writes regularly for The Kitchn and on her blog A Sweet Spoonful. Her work has appeared in numerous national magazines including Better Homes and Gardens, Ready Made Magazine and the Edible publications. When not writing about food, Megan teaches cooking classes and bakes/operates her artisan granola company, Marge, which is distributed nationally and has been recognized by The Wall Street Journal and Sunset magazine. Megan lives in a little blue Craftsman house with her partner, Sam. Visit her blog at asweetspoonful.com.